Very few posts lately, I know. But just because there is nothing doesn't mean there isn't something! I've had my nose to the studio grindstone lately, but I can't show you my two Supreme sewing jobs just yet. I did reveal a peek of one HERE, and here is the other peek. Aren't these four patches pretty? I just love Central Park by Kate Spain! Oh - and my "Supreme Boss", Stephanie, has just had several of her fantastic bag patterns published HERE! Hip, hip, Hooray! You're probably also wondering if I've been practicing on Vinnie! Yes, I have! I made this little blankie for Sophie recently. It's just a simple quilt sandwich that I made to practice turning a quilt. All I did was stitch a stencil pattern in the middle, then a panto around the edges. Instead of adding a real binding, I brought the backing around to the front, folded it over and stitched it down. I discovered that it's really easy to turn your quilt! There are a lot of mistakes in it, but it's just practice and helped me immensely! I also ordered a set of Leader Grips for quicker loading of my quilts - I watched Manquilter demo them on his website and was sold! Yesterday I did some more cutting on my Lil's Simpler Tymes quilt. 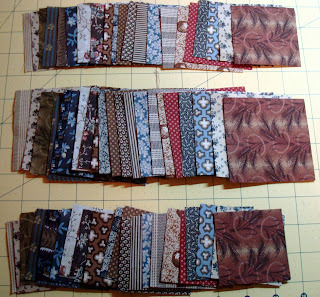 Lots more to cut before I can get to sewing, though. When Mr. 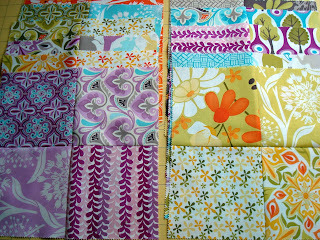 Squash and I were on our recent winter fishing adventure, we stopped at a little quilt shop. He saw this Bali pop and wanted to know if I could make something from it - I think you all know the answer to that question! 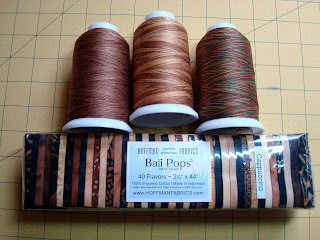 The King Tut threads above are a recent purchase for Vinnie - they will be used on several of my recent finishes! Snow began falling heavily late yesterday and we're expecting several inches - just before we're scheduled to head over the Cascades to a memorial service near Bellingham! The passes have been unrestricted all winter - wouldn't you know it would snow now! Cross your fingers the roads are passable, otherwise I'll be doing a lot more sewing! I'm so excited about your secret sewing project. Wow Miss Sophie can now snooze on her cozy new blanket. Your quilting practice is sure paying off. It look beautiful. King Tut thread is very nice and it's gorgeous with your new Bali fabric. Practice quilt is awesome, Candace!! 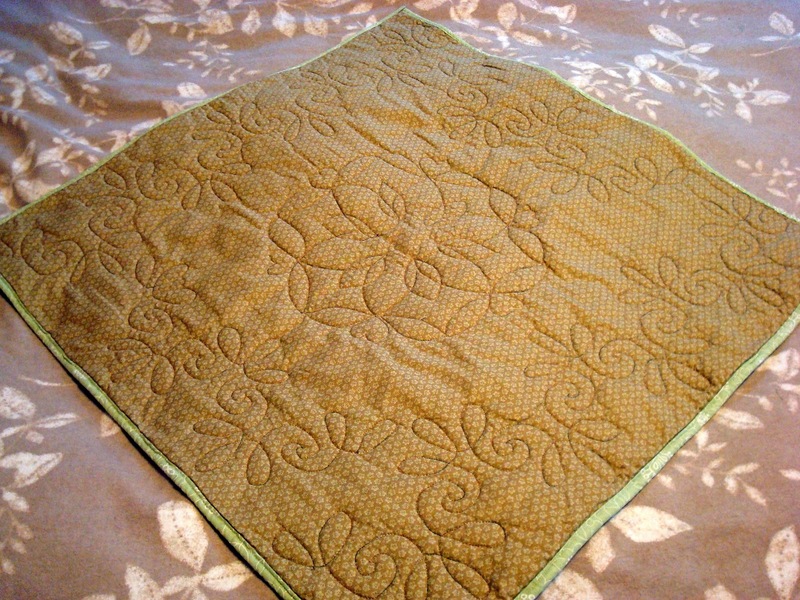 I keep admiring how pretty your quilting is! New threads are beautiful. I can't wait to hear what you think about the Leader Grips. I've been eyeing those myself. Your practice quilting looks great. 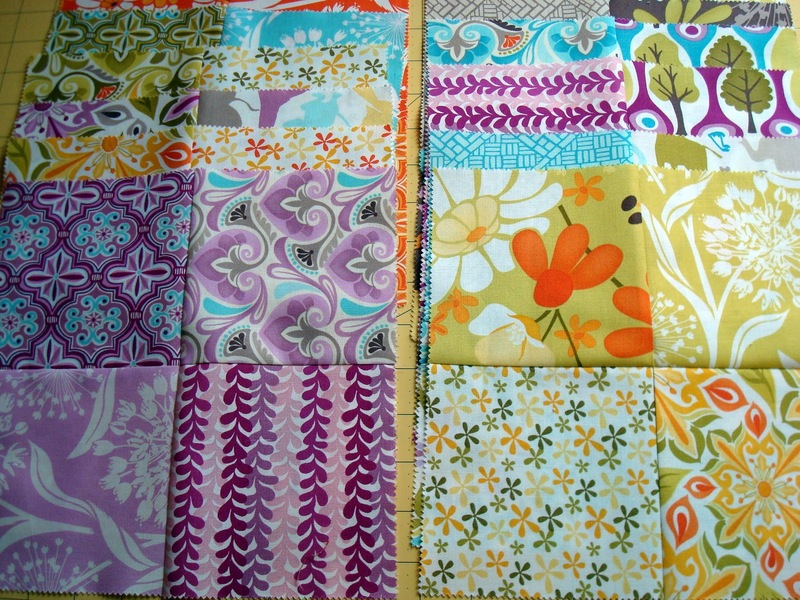 Dying to get my hands on a longarm! Safe travels to Bellingham. Oh my word, Candace, that's a "practice" quilt? You are a natural !!! How beautiful ! Miss Sophie will cuddle up so comfortably. I, sadly to say, am not a natural so the longarm does not come so easy for me. But, I continue to give it my best. You seem to have a very steep learnig curve! The quilting looks great. I'm curious to see your new projects. Sophie is one lucky kitie! Nice little practice piece. i watched the video also. those are something to think about. Looks like beautiful stuff is pouring forth from your studio these days! OOO, I am liking that fabric you are using to test the pattern. Great job, you and Vinnie. Can't wait to see what you make for Mr.S. Gotta love secret sewing!!! And wow you are doing great on your quilting.